Today was deceptively a nice day to go for a ride. The sun was out but there was still a biting wind out. However, I wanted to get out and about and the weather seemed to be decent enough so wrapping up warm, I headed out. 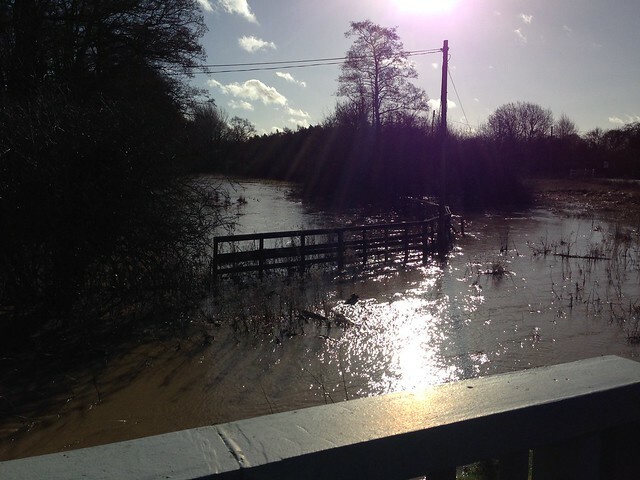 I fancied trying to cycle the Cole Green Way today but I thought with the rain we’ve had recently, this was probably not the wisest idea, as I know the other path nearby, the St Albans Way, has a section that floods in the rain. Well, based on what I saw elsewhere, this would seem to have been a wise choice! 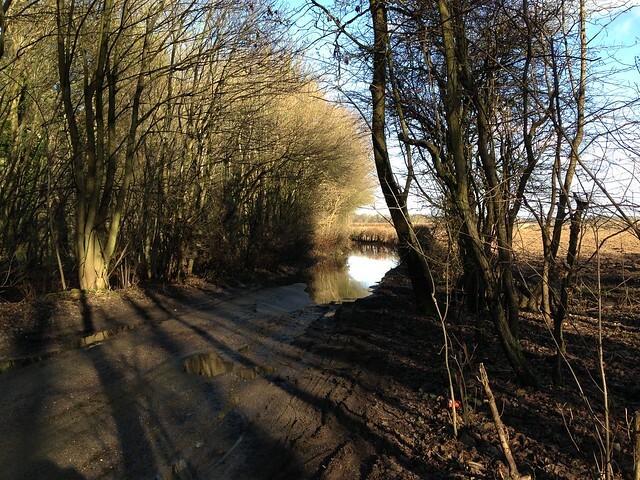 I got out and started cycling, and as I went to turn down a road towards Water End, a kind cyclist coming the other way advised me to turn around as the water was knee deep and not worth cycling through. So I thought I’d cycle the long way around to get some pictures - after all, that’s one of the resolutions this year, to get an image on each ride. Well, I wasn’t disappointed when I got there. You’ll have to view that fullscreen to the get the full effect. As you can see, the whole road was covered - look to the right of the image to see a 4x4 trying to get through it - good thing I didn’t try on the bike! Heading up to Hatfield, I stopped a few times to adjust the saddle - think I’ve got the seat height and saddle position sorted on the new bike now. With this, I was a bit disheartened and thought I’d cycle home along some routes I thought would be fairly clear. Ended up finding a shortcut from Colney Heath into Hatfield that I might take more often (depending on where I need to go in Hatfield!). 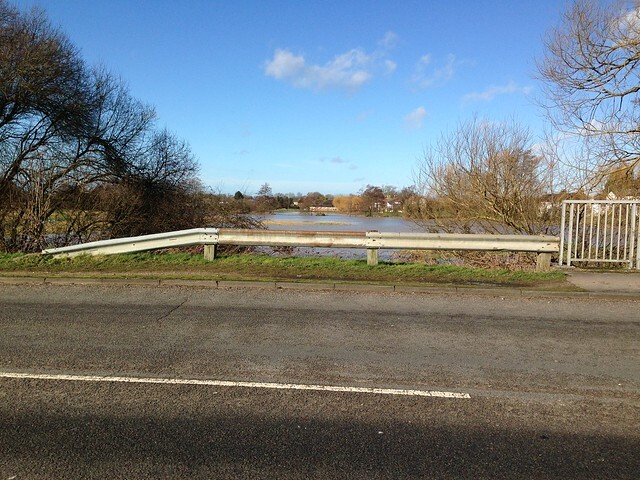 Anyhow, the last few pictures I got were of Colney Heath - the river there was pretty full! With that, I headed back, managing to take the bike around the local quarry and bridleway as the wind round there was amazing - I was practically leaning into it as it was blowing me sideways. Not quite as these roadies but it wasn’t far off (in fairness, I was probably saved by being a bigger chap and riding a heavier bike than these guys and girls!!). Anyhow, a reasonable ride, a bit disappointed with the road conditions but that can’t be helped. In fairness, the conditions today just backed up how more comfortable I felt with a hybrid than a road bike. The flat bars certainly felt safer with the wind (and not to mention the V brakes which would stop me quicker than the road ones!) and the larger tyres helped navigate the puddles and the debris left on the roads from the storms we’ve had around the area.